Drafted in the first round, 8th overall, in the 2017 CFL Draft, Gray joined the club on October 15, 2018 after stints in the NFL with the Green Bay Packers, New York Jets and Cleveland Browns. Gray was first signed by the Packers as an undrafted free agent in May of 2017, before being released at the conclusion of training camp in 2017. He was immediately added to the practice squad of the Jets, but was signed by the Browns off New York’s roster in December of 2017. He was waived by the Browns on August 28th, 2018. Gray was a star during his days at the University of Manitoba. 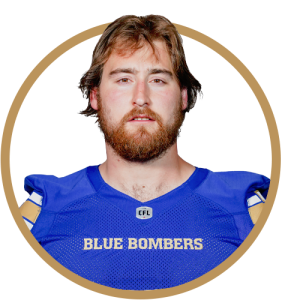 He was named the Canada West Outstanding Down Lineman of the Year in 2017, a Canadian University First-Team All-Star, as well as a Canada West All-Star. He played in 32 games with Manitoba, starting 30, as well six playoff games, playing both guard and tackle.